about the history of Baldwin and the demolition of most of the buildings which began in 1994. "my grandfather, Edward J. Ashby, Sr., worked at Baldwin as an electrician. He was also the head of one of the unions there for a while." "Brother of Edward J. Ashby, Sr.; worked in a management capacity." "My father, Howard Machette, also worked on the locomotive that is in the Franklin Institute. He was a Foreman and welder at Baldwins in the 30's and 40's." Thorton, Pa. His Father walked several miles each day to ride the train to work. My Grandfather is buried in the Masonic cemetery in Tucson, Arizona in an unmarked grave. It took awhile for me to find this out. My Father is buried at the Grove Cemetery near West Chester." "James Leonard Smith was Superintendent of the Foundry at Baldwin during the 30's and early 40's. He went to work for the Baldwin Company as an inspector around 1910." 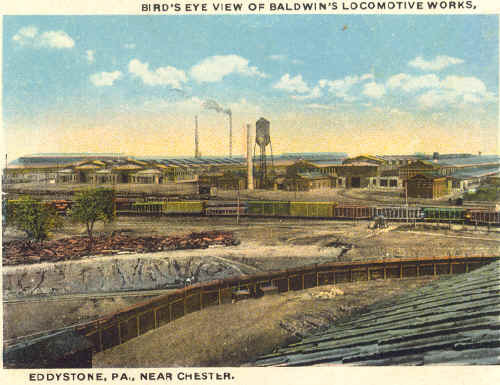 Company History: Baldwin Locomotive Works was established by Matthias W. Baldwin in 1831. Between that time and 1954, 75,000 locomotives were built. The Eddystone Plant was opened in 1906 and that year alone 2,500 locomotives were built. During the presidency of Alba B. Johnson and Samuel M. Vauclain, Baldwin employed over 7000 people. "My late father, Herbert L. Broadbelt, worked for BLW for nearly twenty years in the engineering department until the plant closed. When he left he was allowed to rescue the entire photographic collection and many other items. The negative collection is now in the Pa. railroad museum at Strasburg. Other items may be found at the Historical Society of Pa. and DeGolyer library in Tx. Some pictures of the plant including a few taken by my father were recently donated to HSP. I forgot to mention that I have some Baldwin items left I have not yet sold or donated to institutions or sold to collectors. I have an ad on one or so free railroad websites, but if anyone asks about Baldwin items for sale you might refer them to me." "My grandfather, August Zimath, was a blacksmith at BLH sometime in the 30's, and worked on the large wheels on the locomotive in the Franklin Institute. We're very proud of that bit of family history." 6 - James Edward David Ashby, jeda_88@hotmail.com, grandson of Edward J. Ashby, Sr.